1 L None No Power Seat 1 L is a standard Business Class seat however, the proximity to the lavatories and galleys may be bothersome. 10 L None No Power Seat 10 L is a standard Business Class seat however, the proximity to the lavatories may be bothersome. 21 A None No Power Seat 21 A is a standard Economy Comfort seat. The tray table and personal TV are in the armrest, reducing seat width and making the armrest immovable. There is no floor storage during take-off and landing. 21 C None No Power Seat 21 C is a standard Economy Comfort seat. The tray table and personal TV are in the armrest, reducing seat width and making the armrest immovable. There is no floor storage during take-off and landing. 21 D None No Power Seat 21 D is a standard Economy Comfort seat. The tray table and personal TV are in the armrest, reducing seat width and making the armrest immovable. There is no floor storage during take-off and landing. 21 E None No Power Seat 21 E is a standard Economy Comfort seat. The tray table and personal TV are in the armrest, reducing seat width and making the armrest immovable. There is no floor storage during take-off and landing. 21 H None No Power Seat 21 H is a standard Economy Comfort seat. The tray table and personal TV are in the armrest, reducing seat width and making the armrest immovable. There is no floor storage during take-off and landing. 21 J None No Power Seat 21 J is a standard Economy Comfort seat. The tray table and personal TV are in the armrest, reducing seat width and making the armrest immovable. There is no floor storage during take-off and landing. 21 L None No Power Seat 21 L is a standard Economy Comfort seat. The tray table and personal TV are in the armrest, reducing seat width and making the armrest immovable. There is no floor storage during take-off and landing. 22 C None No Power Seat 22 C is a standard Economy Comfort seat that has extra legroom due to the missing seat in front. 22 J None No Power Seat 22 J is a standard Economy Comfort seat that has extra legroom due to the missing seat in front. 33 A None No Power Seat 33 A is a standard Economy Class seat however, the proximity to the lavatories may be bothersome. 33 B None No Power Seat 33 B is a standard Economy Class seat however, the proximity to the lavatories may be bothersome. 33 E None No Power Seat 33 E is a standard Economy Class seat however, the proximity to the lavatories may be bothersome. 33 H None No Power Seat 33 H is a standard Economy Class seat however, the proximity to the lavatories may be bothersome. 33 J None No Power Seat 33 J is a standard Economy Class seat however, the proximity to the lavatories may be bothersome. 33 K None No Power Seat 33 K is a standard Economy Class seat however, the proximity to the lavatories may be bothersome. 33 L None No Power Seat 33 L is a standard Economy Class seat however, the proximity to the lavatories may be bothersome. 41 A None No Power Seat 41 A is a standard Economy Class seat that has extra legroom due to the exit however, the close proximity to the lavatories may be bothersome. The tray table is in the armrest, making the armrest immovable and slightly reducing seat width. There is no floor storage during take-off or landing. 41 C None No Power Seat 41 C is a standard Economy Class seat that has extra legroom due to the exit however, the close proximity to the lavatories may be bothersome. The tray table is in the armrest, making the armrest immovable and slightly reducing seat width. There is no floor storage during take-off or landing. 41 D None No Power Seat 41 D is a standard Economy Class seat that has extra legroom due to the position of the bulkhead however, the close proximity to the lavatories may be bothersome. The tray table is in the armrest, making the armrest immovable and slightly reducing seat width. There is no floor storage during take-off or landing. 41 E None No Power Seat 41 E is a standard Economy Class seat that has extra legroom due to the position of the bulkhead however, the close proximity to the lavatories may be bothersome. The tray table is in the armrest, making the armrest immovable and slightly reducing seat width. There is no floor storage during take-off or landing. 41 H None No Power Seat 41 H is a standard Economy Class seat that has extra legroom due to the position of the bulkhead however, the close proximity to the lavatories may be bothersome. The tray table is in the armrest, making the armrest immovable and slightly reducing seat width. There is no floor storage during take-off or landing. 41 J None No Power Seat 41 J is a standard Economy Class seat that has extra legroom due to the exit however, the close proximity to the lavatories may be bothersome. The tray table is in the armrest, making the armrest immovable and slightly reducing seat width. There is no floor storage during take-off or landing. 41 L None No Power Seat 41 L is a standard Economy Class seat that has extra legroom due to the exit however, the close proximity to the lavatories may be bothersome. The tray table is in the armrest, making the armrest immovable and slightly reducing seat width. There is no floor storage during take-off or landing. 55 A None No Power Seat 55 A is a standard Economy Class seat in the last row of the aircraft whose proximity to the lavatories and galleys may be bothersome. 55 B None No Power Seat 55 B is a standard Economy Class seat in the last row of the aircraft whose proximity to the lavatories and galleys may be bothersome. 55 C None No Power Seat 55 C is a standard Economy Class seat in the last row of the aircraft whose proximity to the lavatories and galleys may be bothersome. 55 J None No Power Seat 55 J is a standard Economy Class seat in the last row of the aircraft whose proximity to the lavatories and galleys may be bothersome. 55 K None No Power Seat 55 K is a standard Economy Class seat in the last row of the aircraft whose proximity to the lavatories and galleys may be bothersome. 55 L None No Power Seat 55 L is a standard Economy Class seat in the last row of the aircraft whose proximity to the lavatories and galleys may be bothersome. 56 D None No Power Seat 56 D is a standard Economy Class seat in the last row of the aircraft whose proximity to the lavatories and galleys may be bothersome. 56 E None No Power Seat 56 E is a standard Economy Class seat in the last row of the aircraft whose proximity to the lavatories and galleys may be bothersome. 56 H None No Power Seat 56 H is a standard Economy Class seat in the last row of the aircraft whose proximity to the lavatories and galleys may be bothersome. 8 D None No Power Seat 8 D is a standard Business Class seat however, the proximity to the galley may be bothersome. 8 H None No Power Seat 8 H is a standard Business Class seat however, the proximity to the galley may be bothersome. 8 L None No Power Seat 8 L is a standard Business Class seat however, the proximity to the galley may be bothersome. 9 D None No Power Seat 9 D is a standard Business Class seat however, the proximity to the lavatories may be bothersome. 9 H None No Power Seat 9 H is a standard Business Class seat however, the proximity to the lavatories may be bothersome. 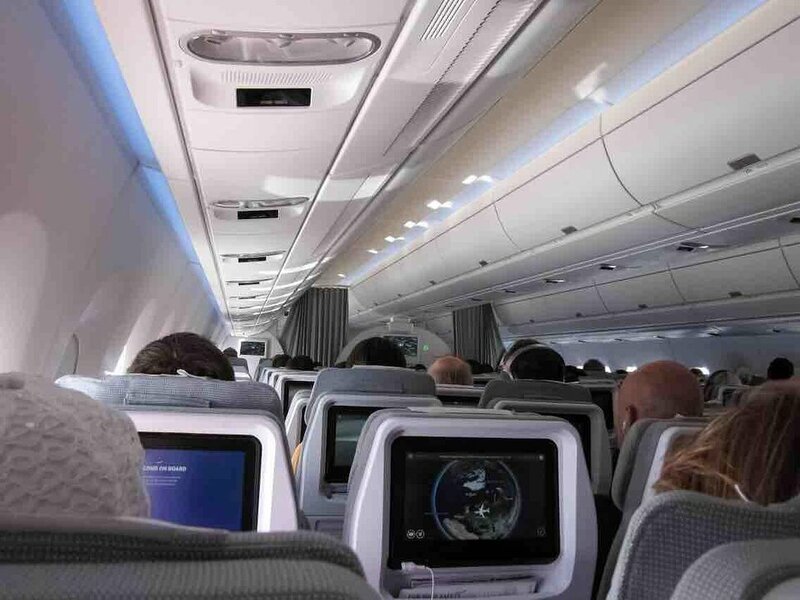 Finnair's A350-900 features a two class configuration with 46 flat bed Business Class seats, 43 Economy Comfort seats with up to 4” of added legroom, and 208 standard Economy Class seats. I agree about interior and cabin climate. The ligth and air climate is very good. The seat on the other hand is to small in my opinion. Im 192cm and when lying down, my feet is cramped up, and my head almost touches the back of the seat. The service onboard is very high standard, and the food and beverage menu is filled with excellent stuff. Inflight entertainment is super, and the screen is big and bright. Comfortable seat, access to two windows, and amazing legroom. Very uncomfortable. No extra mattress added. Feet allowance dont line up with the rest of the bed. This seat has very much legroom and free access to the aisle area, but tray table and entertainment display are in the armrest, making the seat slightly narrower. Also there is no seat pocket or other personal storage space for this seat. Same goes for the 42A. Legroom is good for this seat. However the regular economy seats is not too bad either so for me (I am 1,88m) it was not worth the 95 economy comfort fee for my Helsinki-Bangkok flight. For the first meal beer and wine was clearly included in the price when I bought the tickets, onboard the plane I was told the terms was changed and I had to pay for drinks again. Not a horrible seat, it is the only seat in Economy that has 220V power. It's for medical use. I used it with my CPAP, but it was a major hassle getting Finnair to access it via their customer service. It didn't need to be as it's a standard 220V plug behind a panel in the roof you can open with a pen or paperclip. Worked great for my CPAP. Finnair just needs to improve their customer service and support for clients. Purchased Economy Comfort seat for the 12 hour Singapore-Helsinki leg of my journey. The extra fee was worth it for the additional leg room and reasonable quality noise cancelling head phones. HOWEVER, be aware that Finnair is one the the carriers that allow pets as carry-on for long haul flights. Should you have the misfortune of sitting next to a passenger with a pet (in my case a small dog); your entire journey will be compromised. In this instance the dog carrier took up the entire leg room space of that passenger and she could not place her feet on top of the carrier as it was of the soft variety. As a result she had to place her feet in my leg room space. Finnair does not acknowledge this as being a problem or that they have not honoured their conditions of carriage. Notwithstanding a lengthy correspondence with their Customer Relations they have closed the case with the end result being that it was my problem. They offered as compensation a 40 gift voucher which was subsequently increased to 85; however its use is limited for use with Finnair or their outlets. It is mentioned that in my initial letter of complaint I did not seek any compensation; but was hoping for some sort of explanation to this discriminatory policy. Do not waste your efforts in writing directly to the CEO as he will not give you the courtesy of a reply or even an acknowledgement. Whilst Finnair is often the most convenient and economical way to travel to Finland from Australia, they will no longer enjoy my custom. Leg room is excellent indeed. But there is no front storage pocket/locker so you cannot put your stuff anywhere. Neither floor storage during take offs and landings. Very annoying. Also you feel like sitting in middle of aisle and people trespassing this place are walking straight at you. The locker above row 23 was permanently out of use for those on right side of plane. Not ideal if on a long haul flight with an infant and you would like to have access to bags without putting then at your feet. Seat has good legroom but is not discernibly more comfortable than a standard economy seat which is a little disappointing. The perks are really the noise cancelling headphones and a marimekko night bag. The seat has no storage whatsoever. That means any items you may wish to keep close to hand have to be stowed in the overhead bin. The only alternative is leaving them on the floor which people then have a tendency to tread on. You have to share the in-flight magazine and duty-free guide with the passenger in seat 22B. Window seats are very private, plenty of room in the seated position. The armrest goes up/down so you can get in/out of the seat during meal service. The biggest downside of the business class seat is the lower body space. There really isn't much room to move your feet. And due to the curvature of the seat in front, you can only really sleep on your back or on your right side if you are tall. Windows are huge, cabin feels more comfortable etc than older planes. Be sure to book the special meals in advance. I had the Reindeer and it was delicious. Close to galley and toilets yes although hidden from direct toilet traffic. Traffic to toilet would be no more than other passengers. **What was a challenge is the light from the constant opening of the curtain** If you sleep with eye shades then this wont be a problem unless some people make a noise. For Finnair their staff are very quiet so this was not bothersome. I have to agree with several comments about the business seats. They are very narrow and when lying flat it is as if your legs are not able to lie in a straight line. The area for your feet is even narrower. Storage is low but overhead is fine. Your observation about galley noise is spot on. There was a crew member engaged in loud conversation with a passenger in the galley just i. Front of my seat which was disruptive. I moved to the last row of business. Cabin was much too warm for good sleep. There seems to be problem with the heating and aircon of the plane: it is way too hot in the middle of the plane and too cold on the back. The seat was big enough for me (189 cm, 95 kgs), and also very comfortable. The proximity to the galley did not bother me. The herring bone configuration on the Airbus 350 has resulted in a reasonably comfortable sitting and reclining position but the narrowing of the width into an arrow shape means that the flat bed position is very limiting for the lower part of the body. This space is not designed for well-built Vikings! Asian cabin crew should have ensured a high level of passenger service but several members need to up their standards! A very quiet and smooth plane. Please reconfigure the seating to provide wholebody comfort. Thanks. Much better than 21A/L because of the floor storage you have from the seat in front. The bulkhead for the row 21 isn't worth it compared to other seats in the Economy Comfort section, the reduced seat pitch and TV makes this row unpleasant. Finnair is a good airline and their cabin staff is usually great. Pilots are also known to be of the very supreme standards. So was the case this time. They really give honor to the word "service". The airline is proud of its new A350 and rightfully so. I am an old pilot and can easily see that this is a beautiful very advanced aircraft. Great! But - and this is a bit sad to have to say: the so called business class they have is a bit of a disappointment. I think this is for the regular traveller who thinks it is business and not for the experienced traveller who knows it is not! The chairs have been turned sidewise maybe 10 degrees and the reason for this is so they can cram more chairs in. Result is that you find yourself travelling "sidewise" and that is - at least for me - quite annoying. And the chair does not give good space. Not BUSINESS space. It can be set to a flat bed. But I am 186 cm and had a problem to fit. Since the chair is to be matched with the next one in front of you, the inner foot space is so narrow that my feet could not even be laid down from toe to heel! It felt like a crammed sleeping bag! Chair does not have a good comfortable armrest. Just a misplaced piece that has to be put down on takeoff and landing. Even even when put up it is not doing the job and not comfortable at all. For me travelling so many airlines business classes I found myself utterly surprised how Finnair could make these poor decisions for the so called businessclass. It can not have been a very cunning and experienced boss who decided these chairs would look like this. 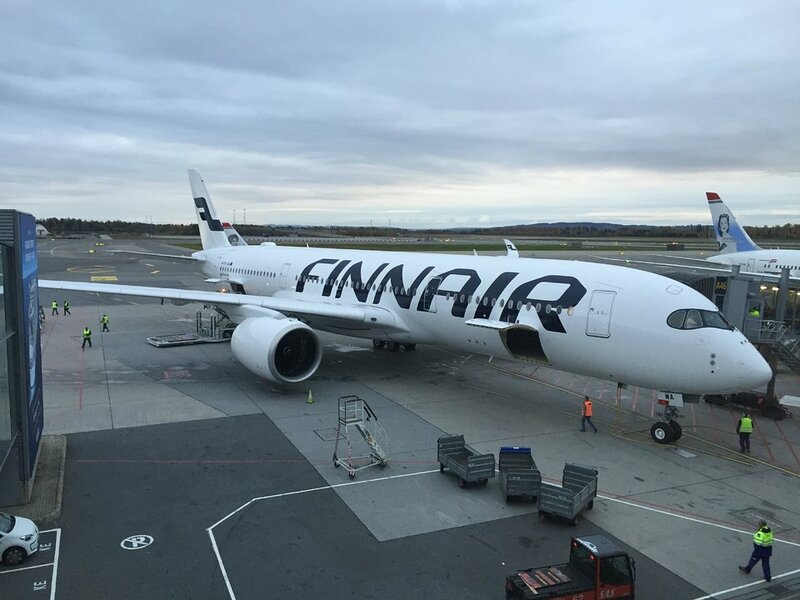 I like Finnair - but this dear friends is a total debacle especially considering it is a brand new proud aircraft! Quite a new experience and my verdict is simple: this is not the businessmans businessclass! It is the sneak version so they can cram more folks in at a higher price. I was quite disappointed. If you like me regularly travel from Stockholm to Bangkok and never choose economy this was not a future option for me since it also includes that I have to make the tiring switch in Helsinki. So I will not go Finnair again on this route. Thai Airways has a businessclass they should compare themselves with. Service on Thai is a lot worse, but the chairs are roomy - and directed straight forward! For me that makes the choice easy since they are also flying direct and price are not that much different. Come on Finnair! Your airline is good and realise you made a bad decision with the seating in A350 business class! Change it! For economy I can not say but looking back in the cabin it sure looked very crammed and uncomfortable! When will airlines stop treating the "flying cattle" just like a piece of meat and actually offer better comfort? Last row seat, normal recline and you do not have to feel guilty about reclining into somebody's lap. Usually they fill the planes from front to back, so on this occation I got the three seat row for myself. The proximity to the lavatory was not as much disturbing as the flight attendants chatting with each other back in the kitchen, you could hear everything they were discussing pretty clearly. Except for that detail, a normal economy experience on the plus side. A code share flight with CA if flying to PEK, recommended if you want to fly Finnair for the price of an Air China ticket (but no ff miles to basically any program). 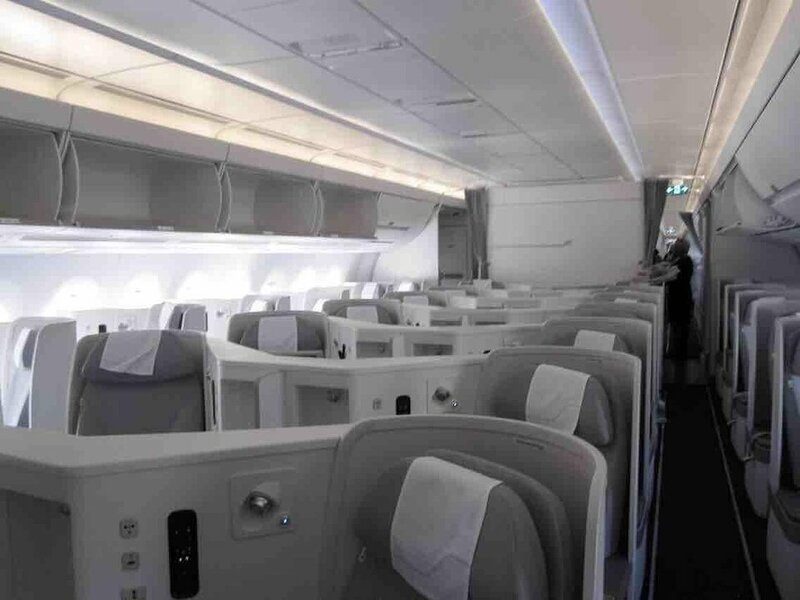 Flew on Cathay Pacific's A350 immediately before Finnair's A350 and found the Finnair business seats to be smaller (more narrow and not as long), with very little storage space. Even though new, the seats were already showing wear & tear and some of the plastic had torn. 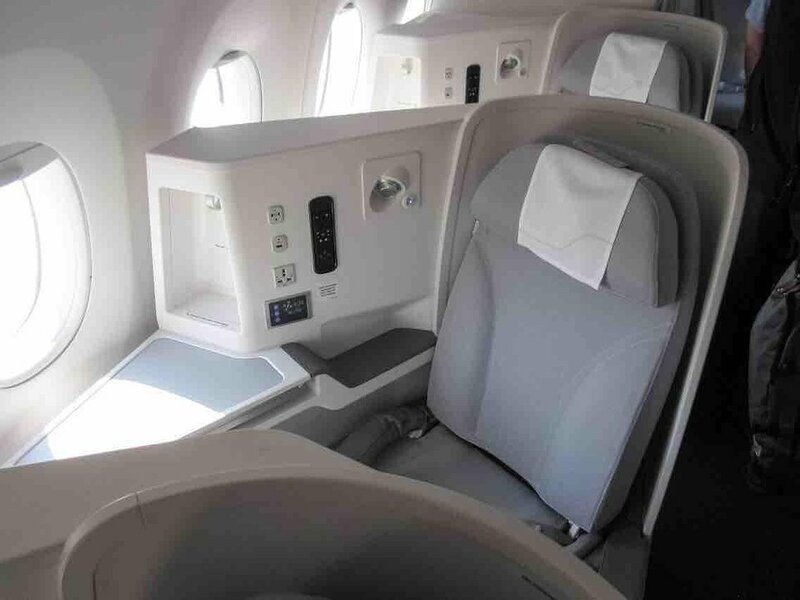 Not bad seats but seems Finnair took the economic route (more dense cabin, cheaper materials) with the business cabin. I found seats 52D to 56H (15 seats in total) lack overhead lockers because of the rear crew rest. I preffer the older seats (2-2-1/ 1-2-1 layout). Herring bone - style middle seat are difficult when traveling with child . Middle seats are missing overhead lockers, witch means that the sidelockers might come very full. This is a nice plane with lay flat herringbone seats. The one thing to be aware of is that there is no overhead storage in the center seating area, so bag storage is limited. Finnair's baggage policy is pretty restrictive, even in business class, so there's not a lot of luggage in the cabin, but it's something to be aware of. 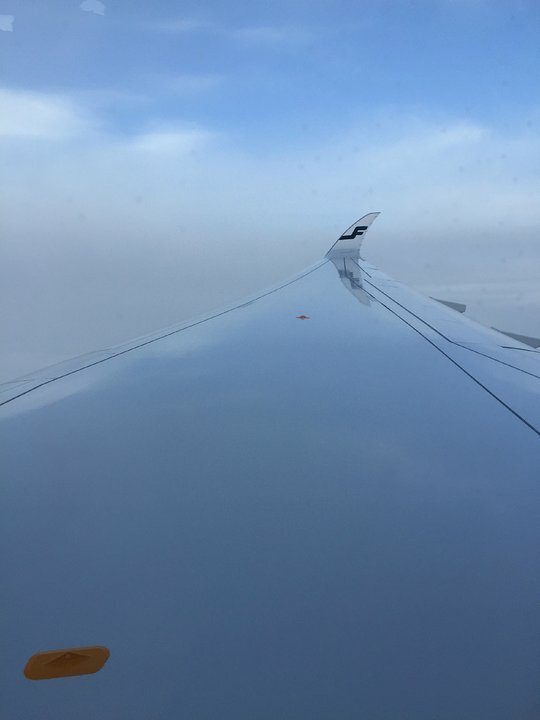 I am a frequent traveler and I am used to all existing planes, but this was my first flight of a A350 and Finnair. A major improvement of flying business. High humidity, high cabin pressure, very quiet. Very comfortable business seats, ideal if you travel with infants. They can sit or sleep on your leg rest while you sit. I booked all my flights from BKK to Europe on this flights. For the entire row 21, it should be noted leg space is reduced vs. other rows in economy comfort, due to the separating wall between business class and economy - this means one cannot stretch her legs (I'm 180cm) which can be bothersome on long-haul flights. Mid section on the back does not have overhead locker space (crew rest is above those seats). The four midcabin toilets are 'over subscribed'. A lot of disturbance is noted from these facilities. Additionally, it should be noted that the mid section for seats 55 D,E,F and 56 D,E,F there is no overhead luggage stowage because of the crew rest facilities. Overall a poor layout from Finnair - too few rest rooms. We were lucky to get the A350 on the relatively short flight from LHR to HEL. The cabin is much airier than the usual A321 used on this leg, or indeed other widebody aircraft. Seats are comfy and plenty of room for my legs at 6'2. Drinks service starts at the back and front of economy but no snacks. OK seat, good service. Enjoyable flight. The footend ends in a triangle under the front seat. It is very small and not allows sleeping for guest over 1,80 meter size. The video system von panasonic not working well. They had to reboot it three times which not solvers the problem, that one row could not use the system. There is only hand baggage space at the window sides. So the guest in the middle have to join with the windows seats the space. This seat is perfect located regarding the window's position. The box for the in-flight entertainment system, which is considerably narrower than usual, is situated at seat K (between seats J and K). The toilets (in economy at least) are very small.